Up for review today is the AVO Improvisation 30 Years, a cigar celebrating the 30th birthday of AVO cigars as a company. It’s a bit of an intimidating cigar to approach, mainly because it’s 7.5 inches long – quite a time commitment. 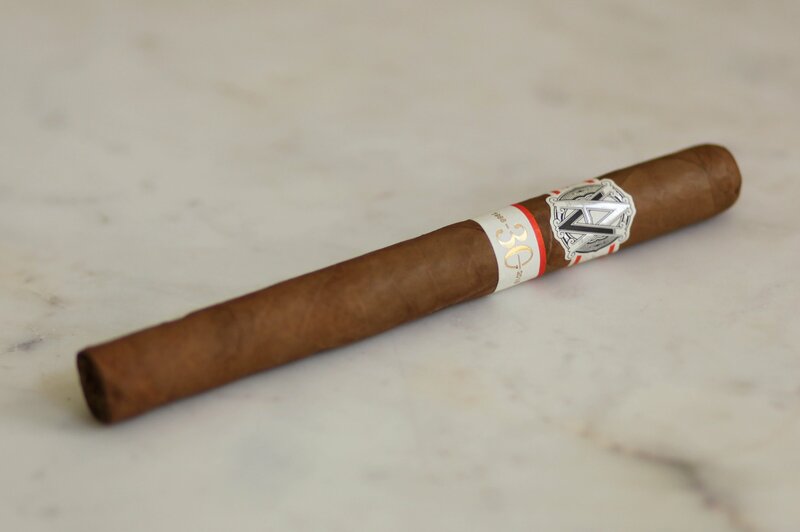 The limited edition release is based on one of AVO‘s classic cigars, the AVO No. 3, which is the same size and shape, but features an Ecuadorian marron wrapper instead of the No. 3’s Connecticut shade wrapper. With all that said, let’s get on with the review. 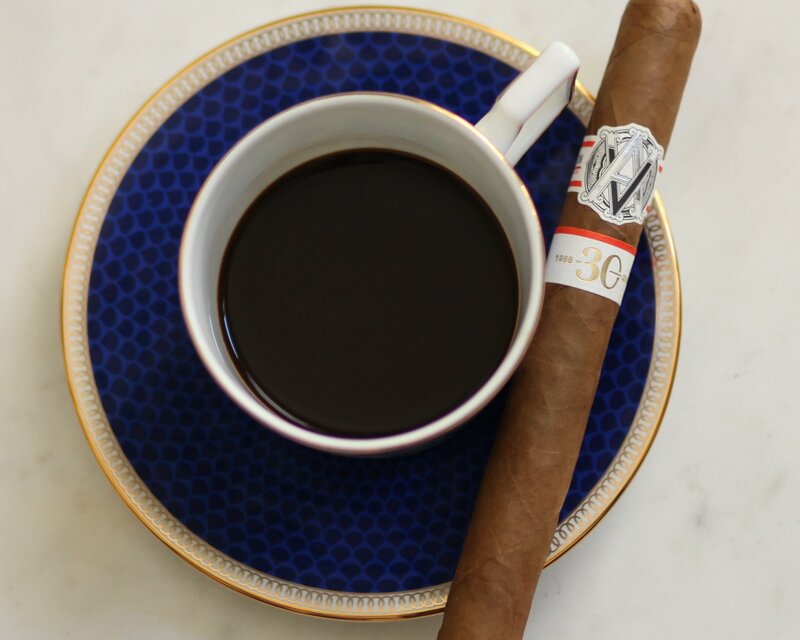 The AVO 30 Years is a really gorgeous cigar, particularly the branding. The dual band features sharply contrasting colors of white, black, silver, and bright orange. It’s really perfect. It doesn’t end with the band. The outer wrapper has a few noticeable veins but otherwise is very soft and velvety to the touch, with a slight oily sheen. Off the foot, I pick up bright aromas of cedar, light spiciness and perhaps some cinnamon. The pre light draw on the other hand is round and soft, revealing some earth and sweet natural tobacco notes. The AVO 30th opens with an interesting profile: just below medium in strength and quite salty, with a very finely textured spice mixed in. A quarter of an inch in, the profile expands with some prominent nuttiness, vanilla, and cedar notes. Smoke production up until this point has been moderate (more would be nice), but the long size helps keep the smoke very cool. By an inch in, the burn is razor sharp. Dominant on the palate and in the aromas is salted peanuts and something like dusty old wood—enjoyable but I’d love some brown sugar or something sweet in the mix to balance out the saltiness. Heading in to the second third, the body has remained below medium but the strength of the flavors is at or slightly above medium. There’s a very subtle creamy sweetness, but nowhere near enough to balance out the nutty, woods, and slightly dusty primary flavors. The retrohale has ramped up considerably with a decent dose of white pepper. At this point I’m just not enchanted by this cigar like I am by most of AVOs limited edition offerings. By halfway, the first major shift comes in the form of the nuttiness and saltiness drawing back while floral and hay edge forward. It’s a good change, but it is ultimately fleeting, with the salty/savory notes continuing to overassert themselves. The final third is mostly more of the same, but the strength and body are both above medium. The pepper at this point plays nicely other flavors, but it’s too little, too late for this cigar. I’m a huge fan of AVO cigars, and particularly of their limited release lines. But I can’t help feeling a bit disappointed by the AVO 30th. It had some enjoyable moments, but by and large the profile was overly dominated by the salty, nutty, and peppery notes. For a smaller cigar, it might be more manageable of a smoke. Seven inches is just too long for so little progression in the flavors. I won’t be returning to this particular line.